Bob Gaughan recaps the college football weekend, with a Buffalo and potential next Bills quarterback slant. Oklahoma State QB Mason Rudolph had been near perfect to the start of the college football season. In The Cowboys home loss to TCU, 44-31, we saw some areas of concern. Rudolph threw for 398 yards and two touchdowns but he made some critical mistakes as well. One strip sack and another interception were caused by Rudolph’s inability to feel pressure coming from the backside. His lack of pocket presence in these two critical cases is a cause for concern for NFL fans wanting him to be there next QB. The star of the NC state’s 27-21 win over FSU in Tallahassee was edge rusher Bradley Chubb. Chubb had two sacks and a forced fumble in the game. He was a force all day long that the Seminoles couldn’t handle. Seminoles safety Derwin James had a bad whiff tackle on Jakobi Meyers’s 71 yard TD pass in catch in the first half. James is supposed to be a top 10 pick. Needless to say this won’t make his highlight reel. That missed tackle was a microcosm of the Seminoles day. Poor tackling from the defense was a huge reason the Wolfpack came away with the victory. The Trojans won in Cal 30-20 but they still didn’t look like they were a team that should be playing for a title. Cal outgained the Trojans by 50 yards and the two teams didn’t look that far apart. Sam Darnold struggled to finish off drives and threw another interception. Darnold has now thrown seven INT’s on the year. He threw nine all of last year. Darnold’s numbers were 223 yards with 2 TD’s. The USC defense forced turnovers and won the game for the 4-0 Trojans. Oklahoma had a much tougher time than expected against winless Baylor. Oklahoma pulled out a 49-41 victory. It was more the Sooners running game than Baker Mayfield that ruled the day. Abdul Adams rushed for 164 yards and Trey Sermon had 148 yards on the ground. The two combined for three TD’s. 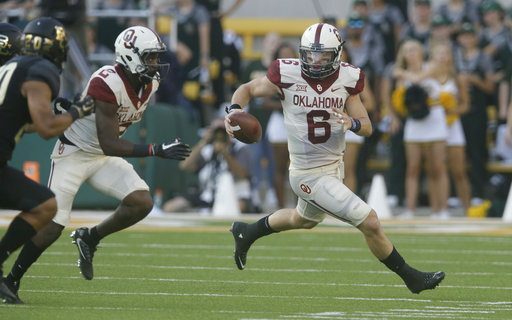 Baker Mayfield was efficient going 13 of 19 for 283 yards and three TD’s. Mayfield is a very emotional player and got unsportsmanlike conduct penalty late in the third quarter that looked like it might hurt the Sooners. Mayfield connected on a 48 yard TD pass on the next play. Oklahoma hasn’t lost in 372 days. It’s one thing for Josh Allen to struggle against Iowa and Oregon. But to throw for under 100 yards against Hawaii at home doesn’t bode well for a guy once considered the first pick in next year’s draft. Hawaii out gained Wyoming 450 to 269 yards. Allen was only 9 of 19 for 92 yards and one TD. OUCH! Josh Rosen Threw for 480 yards and three touchdowns vs Stanford. The problem was two of those TD’s occurred late in the second half after Stanford had a big lead. Rosen even admitted after the game he needs to cut down on critical turnovers. Rosen had two picks on the night. The star of the game was Stanford RB Bryce Love who ran for 263 yards and a score. Trace McSorely found Juwan Johnson in the back of the end zone on the games final play to pull out a 21-19 win for the Nittany Lions over a stubborn Iowa team. PSU dominated the game outgaining Iowa 579-273 on the night. Still two fourth quarter TD’s by Iowa gave them a 19-15 lead with 1:42 left. McSorley led Penn State a 12- play 80 yard drive to close the game. Penn State ran 99 plays to Iowa’s 45 and PSU had 29 first downs and held Iowa to only 11. The good news is that UB defeated Florida Atlantic and Lane Kiffin 34-31 at UB Stadium. The victory pulled the Bulls to 2-2 on the season heading into conference play. The bad news is they lost star QB Tryee Jackson to an injury just before halftime. Drew Anderson came in and played wonderful in the second half to lead the Bulls to victory. Anderson’s 20-yard TD pass to Anthony Johnson late in the fourth quarter gave the Bulls a 34-24 lead. The Bulls defense played inspired ball in the second half and shutdown the Owls offense after the break. Jackson’s injury occurred just before halftime. More will be known in the coming days about how long Jackson will be out. The score was 17 all at the break. UB travels to Kent State next week to open up conference play.